I have been doing car boot sales for about 9 years (in America these are called Flea Markets) when I first of all went to a car boot sale I always thought they were for granny's who want to spend their spare time buying stuff that no one else wants, but I was very, very wrong! 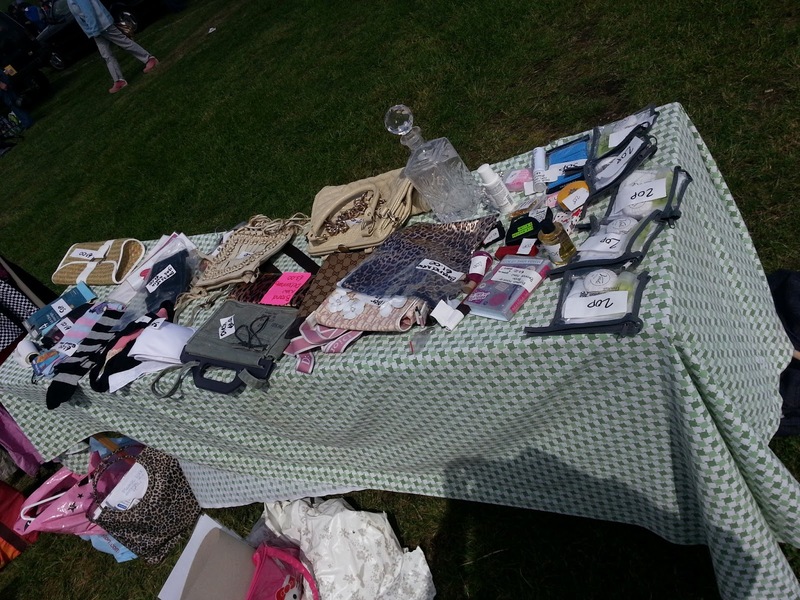 Car boot sales are a great way of making extra cash, meeting new people and spending your day in the sunshine. As I have already said in previous posts that I am moving house at the end of June, most of the things in my loft came with me from my storage unit and it has given me the perfect opportunity to replenish my car boot stock and make some extra money for all the removal costs I will incur (amongst other things). You can also find your nearest car boot sale in your local paper where many schools advertise up-and-coming car boots for bank holidays and any other times of the year they fancy doing one. Once you have picked a car boot sale that is in your area and are familiar with where it is, check the weather forecast and if there is a chance of rain then to be honest I really wouldn't bother because the hassle of having soaking wet clothes and stock to put out to dry just isn't worth it. Spend this time instead getting your car boot stuff ready for the following weekend? Just don't bother doing a car boot if the weather looks at all iffy. If the weather is looking good then I would get your car packed up and ready the night before, this makes it all less hassle in the early morning when your half asleep and it also means that when you get up on the day of your car boot sale then you are all ready to rock n roll! Make sure you leave in plenty of time to get to the car boot early and set up. Pitch money - some car boots charge anything from £10.00 upwards, so make sure you have this ready to go. Change - make sure you have some change with you no matter how small it is because it will be needed at some point, people love to give you pound notes in different denominations for the smallest items they want to buy especially if they have just arrived at the boot sale! A cross body bag - do not leave your change in an open car it will get stolen, and by you leaving your car boot open or car door open you will have your interior light on the whole time (you won't realise this till it's too late) and in-turn drain your car battery! It's not worth the hassle so bring with you a small cross body bag that will house your car keys, mobile phone and your takings and change, and keep your car locked at all times. Packed lunch - I don't eat from any greasy spoons on site at car boots, instead I take a drink, crisps, antibacterial hand wipes, chocolate and biscuits. Of course this is my own personal preference but you are welcome to take what you like - be it a thermos of tea or whatever! Coat or hoodie - being outside as you can imagine the weather can be changeable sometimes the forecast will say 'mild' but with you being in a field and exposed to the elements, scarves and gloves especially in the winter are a MUST! Paste table or other table - a paste table makes a convenient table for boot sales because it folds up and is light to carry, make sure you put one in the car with a table cloth too,this will cover up the unsightly paste table and make your items on the table look more appealing. A chair for you to sit on - if you are doing a car boot on your own, then take one seat if there are two of you then take two seats these could be garden seats or the ones you use for fishing 9as long as they fold up who cares, right?) - but something is better than nothing and I swear by my little seat especially if its been raining the night before and the ground is wet. My seat folds up like an umbrella and is extremely easy to store away. Hanging rail - I have several of the professional hanging rails that are made of sturdy metal and are fully collapsible - they are a godsend and I can't tell you the amount of times I have watched those flimsy Argos hanging rails fall over full of clothes and dent someone's car in the process! Make sure you take a bag of hangers for your items to go on the rail too! You can pick up a sturdy hanging rails from eBay or a shop fitting store online - just Google 'hanging rails' and you'll find one. Little bag of labels and signs and pens - The picture below is my little bag of goodies for car boots. 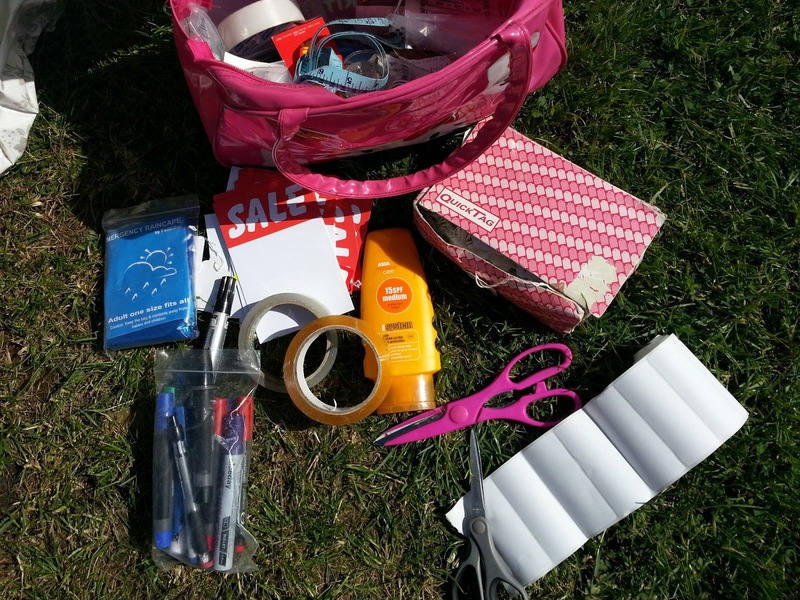 It contains everything from brown tape and sellotape to labels, marker pens in every colour, bits of card and sun-cream, you easily catch the sun without realising it at car boots because your so busy setting up and talking to people. Also don't forget to take empty plastic bags, if people buy something from you they (from my experience) get the 'hump' if you don't offer them something to carry it all in! Signage to me is king - I was lucky to have a laminator in my last job so I sneakily laminated several signs for car boots, I don't have many of these left now though, but any sign will do on a bit of card - it will save your voice when people keep asking you the price of stuff and also sometimes customers don't want to ask the price they prefer to see how much things are right in front of them. I guess it makes shopping easier?! My paste table is quite empty in this photo and the poor thing is really old and won't last me much longer. I have my eye on several collapsible tables on eBay that I need to invest in. If you want to sell something for a particular price and you don't want to go lower then tell the customer that you won't go lower, at the end of the day it's your stuff your selling and it's also your time, energy, petrol money and pitch money to do car boot sales so keep to your guns! Tell them the price is the price and that's it! If all else fails and people keep trying to knock me down I say this (don't laugh!) "I'm selling it for a friend I couldn't go any lower in the price sorry!" this old chestnut of a saying always goes down well, and I usually get the full price for the item without any quibbles. I'm not telling you how to do a car boot sale, far from it - these are just my tips and tricks to enable you to enjoy what's left of the British summertime and make yourself some tax free cash!! 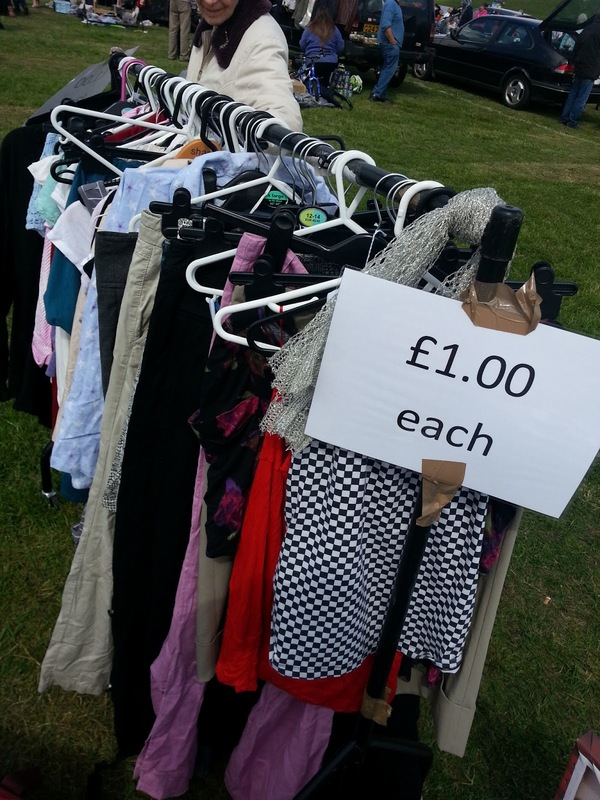 Let me know what you think about car boot sales?